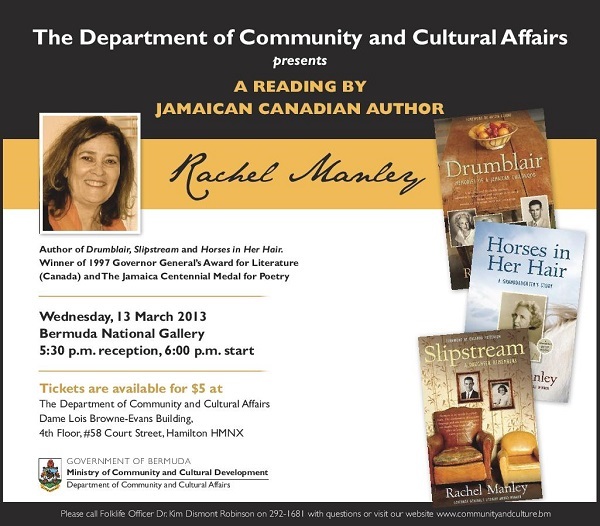 The Department of Community and Cultural Affairs will host a reading by Jamaican Canadian author Rachel Manley, the daughter of former Jamaican Prime Minister Michael Manley. Now resident in Canada she is the author of the memoirs”Drumblair: Memoirs of a Jamaican Childhood”, “Slipstream” and “Horses in Her Hair” and has also published several volumes of poetry. Ms Manley is the winner of 1997 Governor General’s Award for Literature in Canada and The Jamaica Centennial Medal for Poetry. The reading will be held tomorrow [Mar 13] at the Bermuda National Gallery, with the reception starting at 5.30pm, and the reading starting at 6pm. Tickets cost $5 and are available at the Department of Community and Cultural Affairs in the Dame Lois Browne-Evans Building on Court Street.